Since the goal of NaNoWriMo is to write a draft of a novel in just a month, there isn’t time to reread, revise, edit and produce final drafts in that month. And since every student is writing such a significant amount, there also isn’t time for teachers to read every draft from start to finish. So how can we assess our students’ work during their month of literary abandon? How do we hold them accountable for their writing? Even more important, how do we give them the feedback they need to learn from and improve on the writing they do? Milestones: since our focus in November is reaching individual word count goals by the end of the month, it makes sense to hold students accountable for milestones along the way. A grade could be given for reaching every 10% milestone, or they could just be held accountable for the 50% and final 100% marks. When my students get to 50%, they earn a NaNoWriMo pin to wear with pride, along with points earned. And there is a great deal of cheering and applause as we each hit the 100% finish line. Reflections: their homework during November is to work on their novels, usually for about two hours over each week’s time. In class each week, they complete a Google Form that asks them a couple questions about the work they did over that two hour period: What conflicts did they add? How did the conflicts affect the characters? What have they learned about the writing process? What have they learned about their own writing habits? How do they get through writer’s block? How has their plot changed due to this week’s writing? What themes do they see emerging? Their reflections not only show me what work they did at home, but they also help my students see how much they are learning through this process. Novel Info page: early in November my students complete their novel information pages on the Young Writers Program NaNoWriMo website. This includes a title and summary of their novel, an excerpt from it, and a cover design. One beautiful line: my students choose one line from their novel that they will revise, submit for a grade and display on the wall. A valuable extra step is to have them write a paragraph on why they think that line is particularly effective. 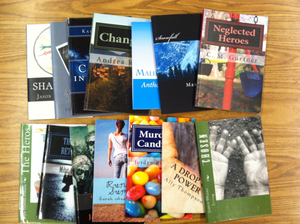 Excerpts: students choose one-page excerpts from their novels that they will revise and polish into final drafts. In these excerpts, I ask my students to demonstrate the very skills that we had been working on prior to starting NaNoWriMo: character development, effective dialogue, setting details, etc. We tackle one at a time: students double-space, print out and bring in one excerpt and we work on it in class just like we would any other piece of writing. While their novel continues to be a work-in-progress, these excerpts become final drafts worthy of a grade and a place in their portfolios. 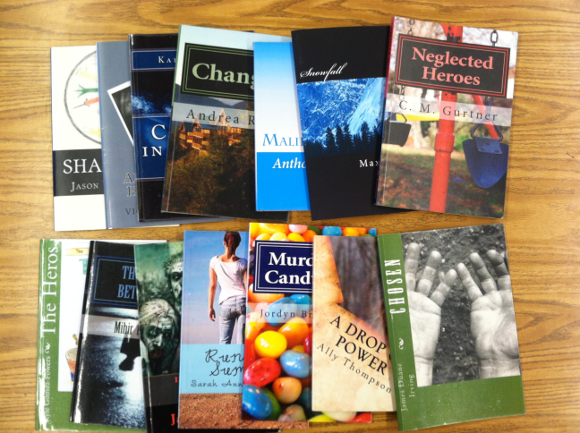 Analysis: just as I ask my students to analyze author’s purpose in novels that we read, now is the time for them to analyze some of the decisions they made as authors of their own novels. They choose a line or two from their work and write analytically about its context: How has a character developed and why? How does a particular setting contribute to the story? Why is a certain simile effective? What theme emerges from their story at this point? complete, revise and edit their novels so they can publish them for free and sell them on Amazon. How else can students be assessed for such a significant piece of writing? How do you assess your Wri-Mos? 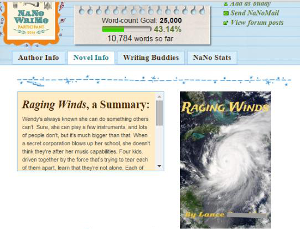 This post is fourth in a 4-part series on NaNoWriMo in the classroom. Part 1 explains NaNo and its benefits. Part 2 offers tips on getting started. Part 3 makes recommendations for activities and resources during NaNoWriMo.